Once again the crass errors of the International Olympic Committee and their desire for cash out of lucrative sponsor contracts have put us in front of the obligation to choose whether supporting Olympic Games held in a totally undemocratic country. When Beijing got the nod for this summer games, I already thought it was a mistake, that after the fiasco of granting the games to Moscow in 1980, the IOC would have known better than to take a chance with China. Yet a few voices were convincing enough to tell us that there were profound changes taking place in China and granting Beijing the games (above much better suited places such as Paris, by the way) could only but speed up these changes. Today we know that once again we were lied to by the likes of IOC chair Rogge, a curiously appropriate name in the light of the extreme discretion of the IOC over China constant violations of Human Rights. After the protests in Greece when the Olympic torch was lighted, Rogge had the nerve to state again that it was good to award the games to China, and again told us about his alleged "silent diplomacy". Unfortunately that was very easy to debunk since there might be a "silent diplomacy" to pressure China but the results are even more silent, when not deafening in Tibet. So, for the second time in my life I will be forced to ignore an Olympic Games. 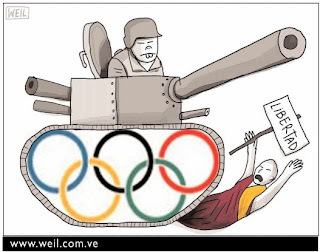 But this time I will also list all the sponsors that are supporting the games of a country that promotes such awful regimes as Burma or Sudan and its Darfur genocide, besides the obvious repression in Tibet and its continuous colonial policy of "Chinification". Those sponsors include some companies very easy to boycott for me such as Coca Cola, Samsung, Panasonic or McDonald. Some will be a little more tricky such as Johnson and Johnson or Visa (I guess my MC bills will increase as of now). Some will be a pleasure to boycott such as Lenovo or lousy beer maker Budweiser. At any rate, and thankfully, some are surely already regretting the millions unwisely invested. As for me I will have to buy my future flat screen TV from SONY, unless I find it also involved in that scam. In Venezuela Panasonic and Samsung are cheaper than SONY, to give you some perspective. "The Olympics are a force for good." Not always! The 1936 Olympics, held in Nazi Germany, were an astonishing propaganda coup for Hitler. It's true that the star performance of Jesse Owens, the black American track-and-field great, did shoot some holes in the Nazi theory of Aryan racial superiority. But Hitler still got what he wanted out of the Games. With the help of American newspapers such as the New York Times, which opined that the Games put Germany "back in the family of nations again," he convinced many Germans, and many foreigners, to accept Nazism as "normal." The Nuremberg laws were in force, German troops had marched into the Rhineland, Dachau was full of prisoners, but the world cheered its athletes in Berlin. As a result, many people, both in and out of Germany, reckoned that everything was just fine and that Hitler could be tolerated a bit longer. PS: as a reminder I will like the readers of this Internet page to remember that China is one of these Internet dark holes, along Libya, Iran, North Korea, Cuba, Saudi Arabia and Belarus. [Update] And to top it off, the Washington Post carries a great editorial on the whole business, showing clearly how the hypocrite "silent diplomacy" of Rogge et al has pathetically failed. [Update 2] Looks like more cartoonists are into that boycott bandwagon, Rayma and Weil regale us with two cartoons that need no comment.